The shoulder is the most mobile of all your joints so shoulder pain and injury are common. The reason for this movement is a very small joint contact zone. Substantially this means that your shoulder is quite unstable. That is why your shoulder muscles are so vital to a normally functioning shoulder. Often when you are suffering shoulder pain it is because your muscles are simply not strong enough or they are uncoordinated. Both of these dysfunctions can usually be corrected with a quality assessment and injury-specific exercises. Rotator Cuff, Adhesive Capsulitis, Shoulder Bursitis, Shoulder Instability, Acromioclavicular Joint, Bone Injuries, Muscle Conditions, Systemic Conditions and Referred Pain. Managing your shoulder injury with physiotherapy is usually successful. There are usually two options with shoulder pain: non-operative or surgical. Depending on your condition Mend Physio will advise which option is best for you. If shoulder surgery is required, then your physiotherapist will recommend pre-operative rehabilitation; to either try a physiotherapy treatment approach first or to condition and prepare your body for a surgical procedure. They will then recommend post-operative physiotherapy to help regain your range of movement, strength, speed and function back to normal. Mend Physio will provide you with both conservative and operative rehabilitation options to ensure that you will attain the best outcome for your shoulder injury. 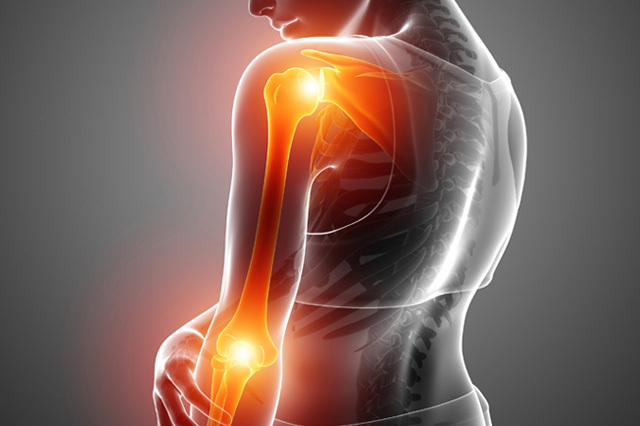 Shoulder Arthritis (Osteoarthritis) is a very common source of shoulder pain as you age. Basically, everyday wear and tear damage your shoulder joints. The chances of you suffering shoulder arthritis are increased if your shoulder has been overworked or injured. As with all arthritis, researchers have confirmed that exercise is the best way of controlling arthritic pain, strengthening your muscles or keeping and improving your joint and muscle flexibility. Exercises will improve both your pain and ability to move about every day. Exercises for shoulder arthritis should be commenced gently and carefully. Mend Physio can guide you through what exercises are best for you and your stage of arthritis. A rotator cuff tear is quite simply a tear in your shoulder’s rotator cuff tendons. A rotator cuff tear can occur in two ways, trauma, and repeated microtrauma. Traumatic rotator cuff tears occur quickly or under heavy load eg a fall or lifting a heavy-weight. However, the most common cause of a rotator cuff tear is repeated microtrauma, which can occur over several weeks, months or years. Repeated rotator cuff injury from straining or pinching the rotator cuff tendons will injure the soft tissue resulting in bruising or swelling. Since there are only a few millimetres separating your rotator cuff tendons from a bony hood (acromion), the additional swelling causes a quicker impingement, catching or squeezing of the rotator cuff tendons. Your shoulder’s rotator cuff is a very important group of four small shoulder muscles that stabilise, control and move your shoulder joint. When your rotator cuff muscles work in isolation they exhibit rotational motion at the glenohumeral (shoulder) joint, which is why they are termed the rotator cuff. Your subscapularis, supraspinatus, infraspinatus and teres minor muscles are the four muscles collectively known as the rotator cuff. Your rotator cuff tears may be partial or full thickness tears. You will notice that your shoulder pain and weakness increases with the severity of your rotator cuff tear. Partial rotator cuff tear may only present with mild shoulder pain, clicking during shoulder elevation and mild shoulder weakness lifting your hand above shoulder height or reaching behind your back. Full thickness rotator cuff tear will normally present with severe shoulder pain and an inability to lift your elbow away from your body. However, in some cases, the rotator cuff tear is so severe that a significant number of your pain fibres are also torn, which can make them less painful but very weak. Mend Physio can diagnose a suspected rotator cuff tear based on your clinical history and the findings from a series of clinical tests. Diagnosing the source of your elbow pain can be complicated as elbow pain can be caused by many different sources. These may be local structures, referred structures and other systemic conditions. Local elbow pain is commonly caused by a local muscle, tendon or joint injury. Alternatively, elbow pain can be referred from your neck joints. The most common source of elbow pain that presents clinically is lateral epicondylalgia (lateral elbow pain). This is also the medical term to describe Tennis Elbow. Medial epicondylalgia (medial elbow pain) is a similar condition on the inner aspect of your elbow and is commonly known as golfers elbow.